The hotel is not exactly located at city center but don't worry it is just few minutes on foot from every where. For those who like calm atmospher it is the exact one. Rooms were clean, staff were kind and helpfull and we had a nice stay there. I loved my room with a view (on 6. floor) and the bathroom with a window & bathtub! The staff are a wild mix of friendly and personable - and not so much. The place is very clean, and the beds comfortable, and I slept very well (: despite the blankets were not duvets). Good place, pretty clean. The location was a little inconvenient. Biggest problem I had was there was no air conditioning. It was extremely hot and opening the window did not help that much. 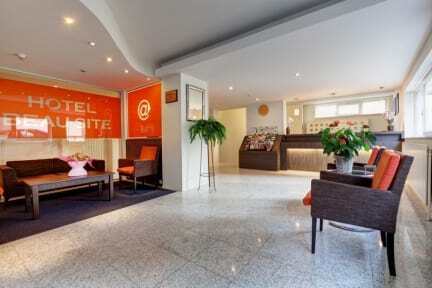 Beau Site provides a good service for a very reasonable price in case one is looking for a Bed & Breakfast hotel. WiFi is stable and fast enough. The hotel is located a bit off the Avenue Louise and tram line connection into town centre. It is also walking distance (20 minutes) from the European Quarter. There are also several squares nearby where one may find good places to eat or drink. On the website there was written that the hotel would offer breakfast, but at the checkout we payed for it :-(. Stayed here for 3 nights in between moving apartments. It was smaller, darker and older than I expected. Nowhere to keep food, just a very early breakfast and some random unusable old hobs in the wardrobe. Bathtub with no shower. When I checked in, staff said I could move rooms the next day as mine was very small (I had not even prompted this) but when I enquired again about it they said they didn't know what I was talking about. Very Bates Motel vibes, won't be returning any time soon. I could have a great stay and give therefore good evaluation, but the Hotel charged my credit card without my permit and still did nothing to help me. Before my arrival they were answering my emails immediately but after I still didn’t have my answer regarding this issue. I payed the hotel in cash and after I leave they charged my stay again, this is so unrespectful that unfortunately the whole evaluation is damaged.